Made by John Black and Meik Thiemann, with help from Rick Osborn. 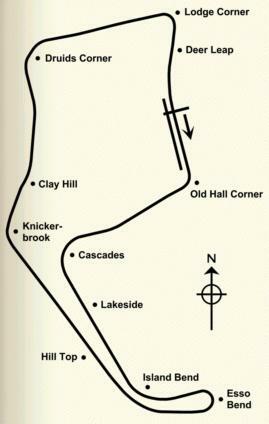 This is a version of Oulton Park as it was in the 1960s. As you'll see, it's not really a finished version, but since I don't know when I'll be able to do much more work on it, I've decided to release this version as it is, and hope to improve on it later. some objects don't have any textures, or only have rough textures. the AI run wide in a few places. I should point out that the AI was done by Meik Thiemann, but it's not at all his fault that there are problems with them. The problems are becuase I've changed the track layout in places after he made the AI files. I'm planning to make some alternative 3do objects to display at long distance, but these aren't done yet so in some places scenery may 'pop up' as you drive towards it. there's no racing groove yet. Hopefully these shouldn't stop you trying the track out. I've also not done much testing of framerates, which could possibly be a problem since in some places there are very long drawing distances, since the track doubles back on itself in a long loop. However it does run reasonably on a PII350/Voodoo3 machine (admittedly just with the standard carset), so hopefully there won't be too many problems. 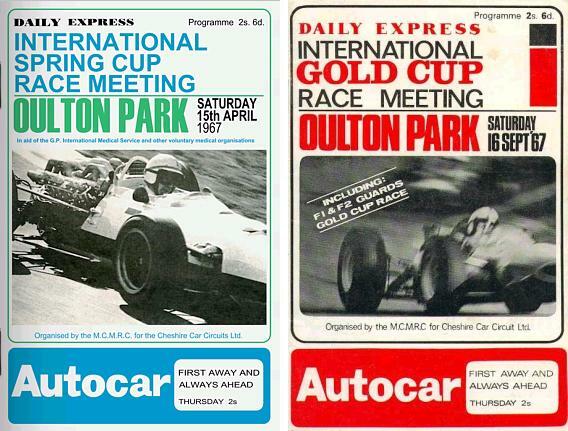 There were two meetings run for Formula 1 in 1967: the Spring Cup in April and the Gold Cup in September. By default the track will install with the programme cover for the Spring Cup, but if you prefer you can convert it to the Gold Cup by unzipping the ColdCupCover.zip file into your 'oulton' track directory. To change back to the Spring Cup simply remove the files page0.pbf, page1.pbf and event.pbf from the 'oulton' directory. The real race lengths were 45 laps for the Gold Cup, and 2 heats of 10 laps and a final of 30 laps for the Spring Cup. However these make for very short races when run at Novice or Int Short, so I've set the number of laps to 60 which gives a more usual race length. Most textures have been done by Meik, with some from myself and from Rick, but there's a few taken from other tracks. Unfortunately I've lost track of where I got some of them from. If you spot any of your own textures that I've used, please let me know and I'll gladly add a credit or remove them if you want. 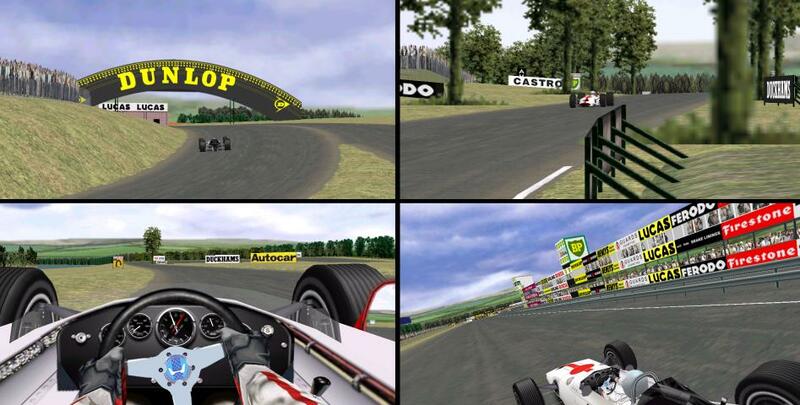 I know there are a few textures taken from some of the GPLEA tracks, in particular Crystal Palace and Snetterton '67, so thanks to the authors of those tracks. Meik and Rick for help with the track and general encouragement. Martin Granberg for the excellent GPL Track Installer. GPLEA for the 'borrowed' textures, and link from their webpage. Anybody else who's textures I've used without realising. The Programme Covers project (http://www.progcovers.com/) for programme covers. Installation instructions - as usual, unzip into a temporary directory then run the TrackInstall.exe program. Installation instructions - unzip the files into your 'oulton' track directory. To switch back to the default (Spring Cup) programme - remove the files page0.pbf, page1.pbf and event.pbf from your 'oulton' track directory.